As Baylor fans cheered the Bears to back-to-back Big 12 championships in the beautiful new McLane Stadium, they enjoyed the best-connected stadium experience--enhanced by in-stadium Wi-Fi Coaches--in college football. 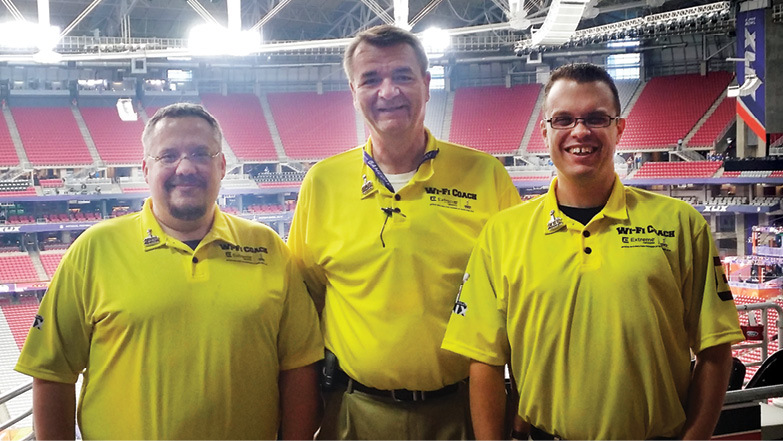 Baylor's leadership in collegiate Wi-Fi connectivity gained national notice and three Baylor staffers found themselves at Super Bowl XLIX in Arizona earlier this year. While the Patriots and Seahawks provided an exciting football game, Baylor ITS Associate Vice President Bob Hartland, BS '81, MS '83, Assistant Director of Systems Support Micah Lamb, BBA '02, and Technology Repair Specialist Andrew Stripling, BBA '00, joined Wi-Fi coaches from NFL teams across the country to help Super Bowl fans connect in the University of Phoenix Stadium. "It was amazing to be able to represent Baylor like this," Stripling said, "as the only university with this system, and the only university invited to be coaches at the Super Bowl." Lamb added, "We learned a lot and got some great ideas from other Wi-Fi Coach programs. I can't wait to implement some of them in the upcoming season at McLane Stadium." That connectivity at McLane Stadium didn't happen by accident. While McLane Stadium was being designed, Baylor's Information Technology Services worked to develop an NFL-quality fan experience by strategically using new, advanced products from Extreme Network. The powerful high-density IdentiFi™ Wireless solution Wi-Fi network--installed by Extreme Networks--and a custom Baylor In-Game app enriched the fan experience through in-seat mobile video replays, team information, customized camera angles and up-to-the-minute real-time statistics through fans’ wireless devices--whether smartphone, tablet or laptop computer. Extreme Networks recognized increased use of Wi-Fi in such athletic event settings also meant users would need help and created the Wi-Fi Coach program. For McLane Stadium, Baylor ITS recruited ITS staff and students to help fans connect and enjoy the capabilities of the stadium’s Wi-Fi. After Extreme Networks was named the official Wi-Fi and analytics provider for Super Bowl XLIX, the company reached out to Baylor Dean of ITS Patti Orr for Wi-Fi Coach volunteers since McLane Stadium was the first collegiate stadium to use the program. Orr selected Lamb, Stripling and Hartland to participate as members of the Super Bowl Wi-Fi Coach team. Lamb and Stripling serve as Baylor's head Wi-Fi coaches. They train and debrief Baylor students who work as Wi-Fi Coaches helping out in the concourses in McLane Stadium. Hartland serves as "the conductor of the Wi-Fi symphony," Orr said, spending game days working behind the scenes in the stadium to help coaches troubleshoot any issues, monitor the network’s analytics, and receive social media feedback from fans. During the Super Bowl, Hartland had a slightly different experience since he was on the front lines helping fans connect, as well as seeing what the pros do behind the scenes to enhance the fan experience. "We had as much to contribute to the other teams, if not more," Hartland said, "which I was very proud of." Orr said she saw the opportunity as "the best professional development I could have gotten for my staff." The trio experienced first-hand how the others handle the coaching program and to share what they learned from Baylor's first Wi-Fi connected season. Today's fans expect great connectivity and an enhanced in-game experience. During the Super Bowl, the Wi-Fi coaches helped 13,500 of the 85,529 fans connect to the Wi-Fi, more than 5 pictures per second were uploaded to Instagram, and 60 percent of the users were sharing on Facebook. According to additional Super Bowl metrics available to the coaches, McLane's network hit every benchmark--and surpassed some--in its first season. "The experience really put into perspective how great it has been to have our fans," because Baylor's participation rate is beyond what they have seen at NFL games, Lamb said. Hartland and Baylor's Wi-Fi team are using the off-season to improve the network for a better fan experience. "To be recognized for our work on campus was very important to the three of us," Hartland said, "but it was more important for Baylor nation to be recognized as leaders in this area."